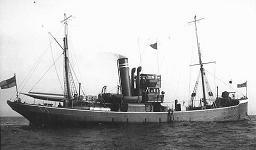 The trawler Bombardier loses 5 crewmen to drowning including her skipper William Robert Nichols lost at age 35. Major Robert Stanley Buck (General List) dies of pneumonia at age 47 at home. He is the son of the late Reverend Bruce Buck. Lieutenant Horace Stroud Daniel (HMS Dido Royal Naval Reserve) dies at age 32. He had been awarded the Board of Trade Medal for Saving Life at Sea. Lieutenant Hubert Bethune Kerruish (Royal Air Force) on a patrol from HMS Campania in a Fairey N1009 sights the wake of a conning tower eight miles ahead which he investigates. The submarine submerges as he drops 100-pound bombs from eight hundred feet, only one of which explodes. Lieutenant George Hawthorn Minot Robertson (Highland Light Infantry attached Nigeria Regiment West Africa Frontier Force) dies on service at home at age 33. He is the son of the Reverend George Philip Robertson. 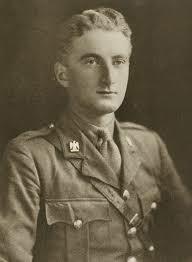 Second Lieutenant Alfred Henry Forster (Dragoons) dies of wounds at age 21 received 17th October 1918. His brother was killed in September 1914 and they are sons of Henry William Forster 1st Baron Forster of Lepe. Sub Lieutenant Percy Trevelyan (HMS Sable) dies of illness on service at age 19. His brother was killed in May 1915. They are sons of ‘Sir’ Ernest John Trevelyan. Chaplain William Brown dies on active service at home at age 28. He is the curate of All Saint’s Church, Hertford. 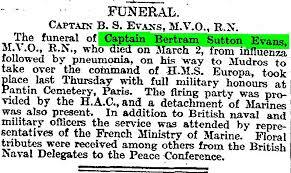 Captain Bertram Sutton Evans MVO RN (HMS Europa) dies on service. He is the son of the Reverend H J Evans. Corporal Bertie Robert Agnis (Royal Army Medical Corps attached Divisional Headquarters) dies of pneumonia. His brother was killed in February 1918. Captain Alfred Castel Symons (Royal Scots attached Tank Corps) dies on service at home at age 23. His brother was killed in April 1917. Lieutenant Joseph Hall Hewitt (Royal Naval Volunteer Reserve HMS Arrogant) dies at home at age 34. He is an organist, artist and cartographer to the Liverpool Dock Board. Second Lieutenant Charles Bowyer Highmore (Machine Gun Corps) dies on service at age 32. He is the son of ‘Sir’ Nathaniel Highmore GBE KCB. Lance Corporal James Chandler (Foot Branch, Corps of Military Police) dies on active service in Germany at age 24. He is a Luton Police Officer. Private Edwin Frank Latter (Labour Corps) dies on service at age 29. He is the last of three brothers who will lose their lives in the Great War.